ACCOUNTING USING EXCEL (R) FOR SUCCESS, 2E leads students to accounting mastery while increasing Excel (R) proficiency. Written with the modern business world in mind, this adaptation of the principles text--ACCOUNTING, 24e--offers an innovative four-step system for students: (1) read the accounting concept and illustration, (2) follow the same concept using the Excel (R) Success Example, (3) practice using the "Try It" Tutorial, and (4) apply knowledge by completing the Excel (R) Success Problem. 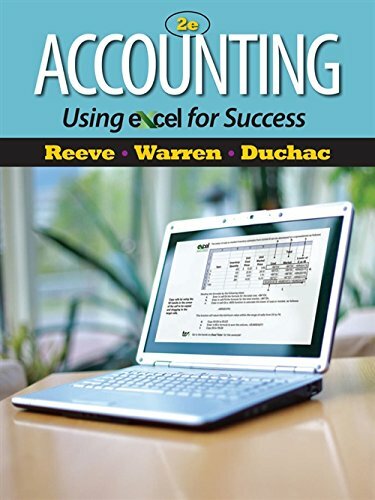 This text reinforces key accounting concepts through six basic Excel (R) formulas. Students build an Excel (R) portfolio to demonstrate basic competencies in accounting and Excel (R). Each new copy of the book comes packaged with an access code that allows students to use the online Excel (R) "Try It" Tutorials. These tutorials guide students through the hands-on process of entering formulas and understanding how to Excel (R) for accounting. Excel (R) Success Special Activities at the end of the chapter require students to manipulate spreadsheets and save the files to demonstrate Excel (R) competency. Within the auto-graded online homework products (CengageNOW and Aplia), students are asked to document their Excel (R) processes. 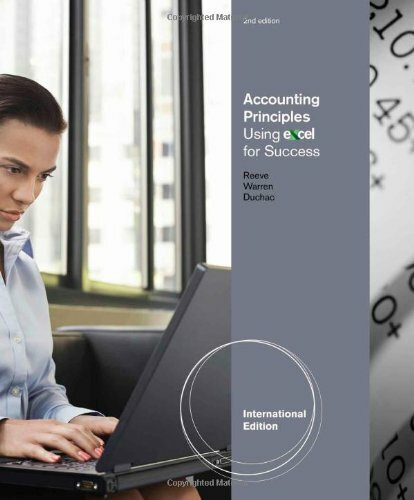 For a complete demo of the Excel (R) Success system, visit www.cengage.com/community/warren. Dr. James M. Reeve is Professor Emeritus of Accounting and Information Management at the University of Tennessee. Professor Reeve taught as part of the accounting faculty for 25 years after graduating with his PhD from Oklahoma State University. His teaching effort focused on undergraduate accounting principles and graduate education in the Master of Accountancy and Senior Executive MBA programs. Beyond this, Professor Reeve is very active in the Supply Chain Certification program, which is a major executive education and research effort of the college. His research interests are varied and include work in managerial accounting, supply chain management, lean manufacturing, and information management. He has published over 40 articles in academic and professional journals, including Journal of Cost Management, Journal of Management Accounting Research, Accounting Review, Management Accounting Quarterly, Supply Chain Management Review, and Accounting Horizons. He has consulted or provided training around the world for a variety of organizations, including Boeing, Procter & Gamble, Norfolk Southern, Hershey Foods, Coca-Cola, and Sony. When not writing books, Professor Reeve plays golf and is involved in faith-based activities. Dr. Jonathan Duchac is the Wayne Calloway Professor of Accounting and Acting Associate Dean of Accounting Programs at Wake Forest University. He earned his PhD in accounting from the University of Georgia and currently teaches introductory and advanced courses in financial accounting. Dr. Duchac has received a number of awards during his career, including the Wake Forest University Outstanding Graduate Professor Award, the T.B. Rose award for Instructional Innovation, and the University of Georgia Outstanding Teaching Assistant Award. In addition to his teaching responsibilities, Dr. Duchac has served as Accounting Advisor to Merrill Lynch Equity Research, where he worked with research analysts in reviewing and evaluating the financial reporting practices of public companies. He has testified before the U.S. House of Representatives, the Financial Accounting Standards Board, and the Securities and Exchange Commission and has worked with a number of major public companies on financial reporting and accounting policy issues. In addition to his professional interests, Dr. Duchac is an avid mountain biker and snow skier. Dr. Carl S. Warren is Professor Emeritus of Accounting at the University of Georgia, Athens. Dr. Warren has taught classes at the University of Georgia, University of Iowa, Michigan State University, and University of Chicago. He has focused his teaching efforts on principles of accounting and auditing. Dr. Warren received his PhD from Michigan State University and his BBA and MA from the University of Iowa. 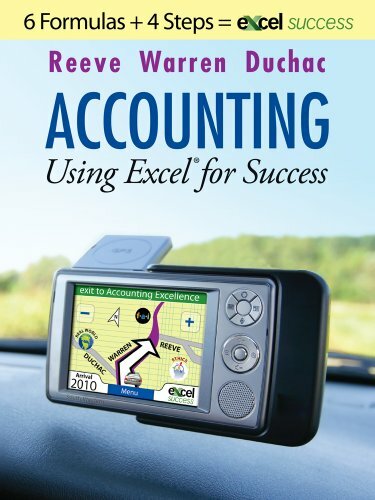 During his career, Dr. Warren published numerous articles in professional journals, including The Accounting Review, Journal of Accounting Research, Journal of Accountancy, The CPA Journal, and Auditing: A Journal of Practice and Theory. Dr. Warren has served on numerous committees of the American Accounting Association, the American Institute of Certified Public Accountants, and the Institute of Internal Auditors. He also has consulted with numerous companies and public accounting firms. His outside interests include handball, golf, skiing, backpacking, and fly-fishing.